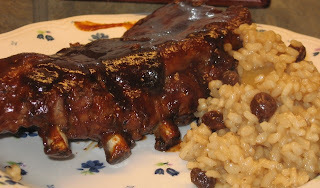 Shelby, over at The Life & Loves of Grumpy's Honeybunch, posted this "recipe" recently. It is more of a cooking technique than a recipe, but never-the-less, it is fantastic and so much fun to bring the tastes of summer indoors during the winter!!! 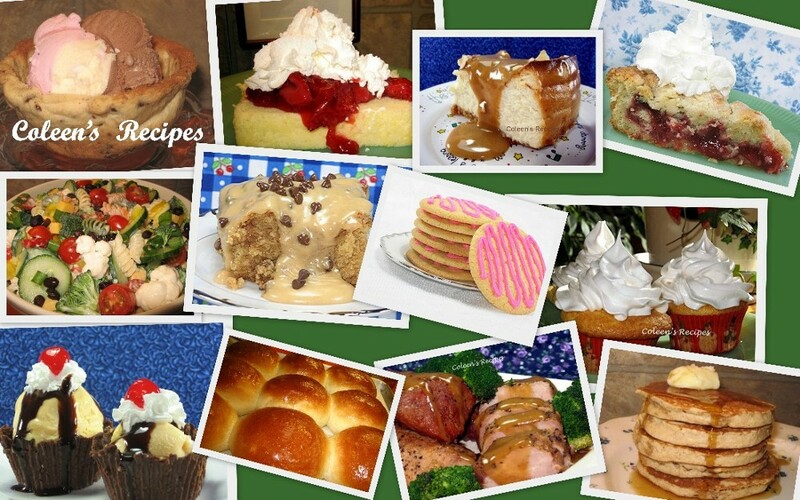 Shelby has such good recipes over there, I hope you will visit her page. This isn't the best photograph, but the ribs QUICKLY disappeared before I realized I needed a better photo, so this will have to do for now. Let's just say that the ribs went from the above condition, to the condition in the next picture in record time. 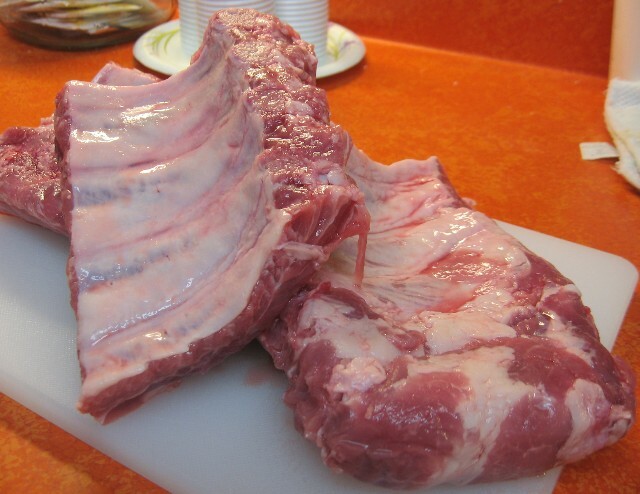 Start with a 2 to 3 pound section of baby back pork ribs and cut them into three sections. I buy the more meaty baby back ribs, so I think next time I'll cut them into even smaller sections. Put the sections in a large deep pot and cover with water. 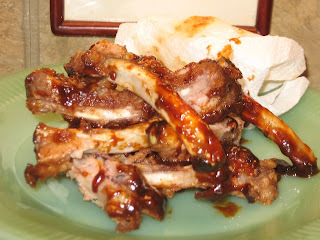 Shelby said to salt and pepper the ribs, but I added a full tablespoon of salt and a ½ teaspoon of black pepper directly to the water. Bring everything to a boil and then reduce to a "high simmer" (not a full boil) for an hour, then drain. 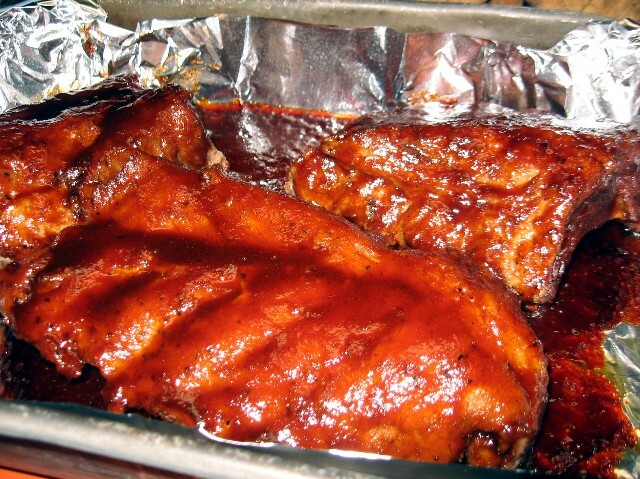 While the ribs are simmering, cover a baking sheet (that has a lip) with foil and spray it with vegetable spray. This will be a huge help in cleanup. Place the boiled ribs bone side up first and cover with a thick layer of your favorite barbecue sauce. Shelby recommends Sweet Baby Rays and I totally agree. Broil in a PREHEATED broiler, on high, for 5 minutes. Remove from oven and flip the ribs over so the meaty side is up. Apply another thick layer of barbecue sauce and put back under the broiler for another five minutes or until the sauce is bubbly and just starting to crisp up (watch it because it will burn quickly if left under the broiler too long). Remove and serve immediately....with LOTS of napkins!!! Delicious, thanks Shelby. This would go so well with my polenta tonight! Following you from Rome. I went to Alaska once, just a stopover on the way to Japan, my husband is Japanese. Hello from Rome! Baby back ribs are my son and husbands favorite dish. This is a great recipe that I will have to try. Everyone loved this! I doubled the sauce... used both white and brown sugars, fresh ginger and added a lil more garlic. Served with rice and veggies. Yummy!! !